Plans for two rowing catamarans have appeared on the wonderful Duckworks website. Designed by furniture maker and boatbuilder Mark Gumprecht of Massachusetts, the cats have their hulls set close so the deck between them forms a narrow longitudinal seat. The rower drops a foot into either hull. 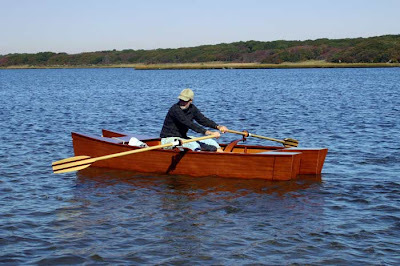 It is a very clever arrangement but it means the feet are much lower than they would be normally, and outriggers are necessary if standard 8ft 6in sculls are used. I personally would be tempted to use much longer, slimmer hulls and a beam of 5ft, so the rowlocks could be mounted directly on the gunwales. The whole thing could be dismantleable to make handling on shore easier. Isn't the finish beautiful? Mark has veneered it with ribbon grain mahogany, which is surprisingly cheap at about a dollar a square foot. He vacuum bags it on with epoxy resin.